The big brother to the LIL' TOM has arrived! 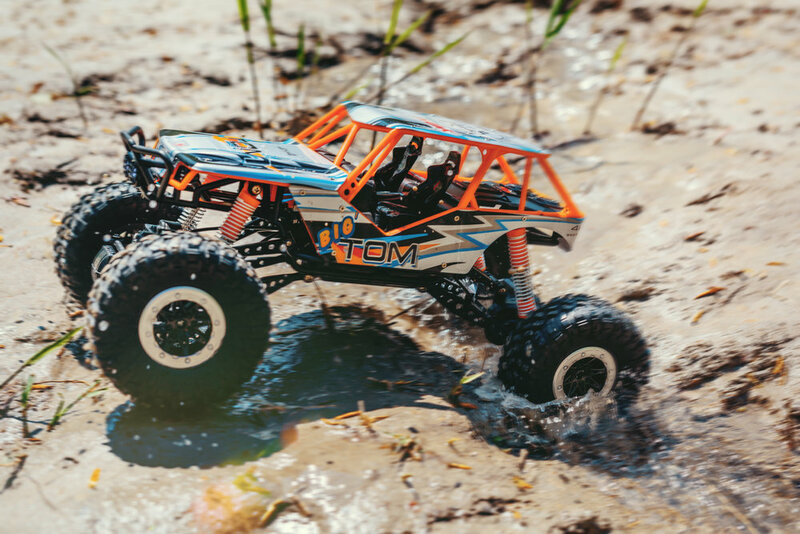 - drawing inspiration from the mini off-roader, BIG TOM scales everything up to the next level. Gigantic wheels, shocks, and suspension travel are the name of the game with the BIG TOM! Like the LIL' TOM and ACE, the BIG TOM sports a muscular exterior roll cage that adds protection and light weight rigidity. Front mounted LED lights illuminate any terrain the BIG TOM is going over - and trust us, this thing can go over almost anything! With an engine located in both the front and rear transmission casings, the Big Tom delivers power to all wheels consistently. Having the engines located lower improves the center of gravity and removes the need for drive shafts. In effect, Big Tom can have an even greater suspension travel! Big Tom brings the largest shocks ever put on a LiteHawk vehicle. Front and rear 4-link suspension allows for an incredible range of motion that enables the Big Tom to tackle a wide variety of obstacles. Learn to drive at a safe speed or unleash the full power of two motors - your choice! Perfect for beginners or kids learning to drive an R/C car for the first time. Have a question about your new LiteHawk? Parts and Technical is here to help!